Looking for ideas how to make your wedding cake table decoration special? How about making a balloon arch to highlight the cake table in a spectacular way? Or why not put some beautiful accents with a balloon heart backdrop, or cute bride & groom sculptures? 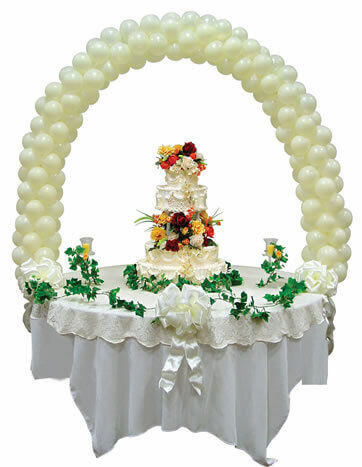 One of the most popular designs for the wedding cake table is the so-called double bubble balloon arch. It combines clear 16" balloons, often with "Just Married" print, with solid color 11" latex balloons inside. All balloons are helium filled and attached to a fishing line. The arch is securely tied to two bases on the floor. These anchors have to be heavy enough to keep the arch in place and they should match the design of the arch, as seen on the picture. A Double Bubble Balloon Arch gives your wedding cake table a festive frame. This wedding arch decoration is just a slight variation of the double bubble design. You have again clear 16" latex balloons, but instead of placing a single 11" balloon inside, they are filled with several 5" balloons. Whether you use a single color, or up to 3 colors of 5" latex balloons, such a multi-balloon archway creates another lovely wedding cake table decoration. These decors don't need helium, but they need a sturdy frame. If you'd like to do them yourself, you can get complete balloon arch cake table kits at Amazon. You have the choice between single and double arches. Most kits I saw do NOT include the balloons. So be sure to order them as well. For a single arch you will need 150 x 5" balloons, for a double arch 300. 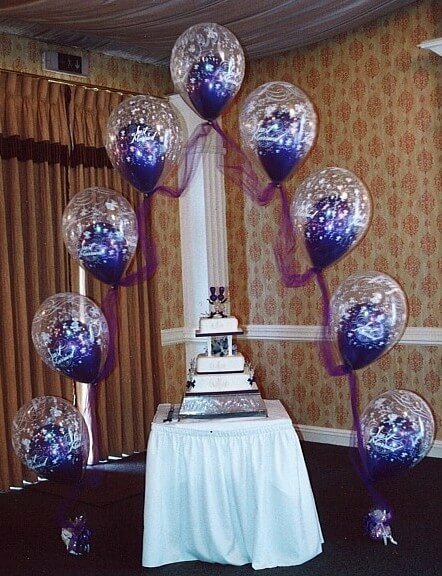 If your cake table stands close to a wall, a spiral balloon heart will make an eye-catching backdrop for it. You can get kits that contain the metal frame, sizing templates and easy to follow instructions at eBay. Search for "balloon heart frame" in the "Wedding" category. 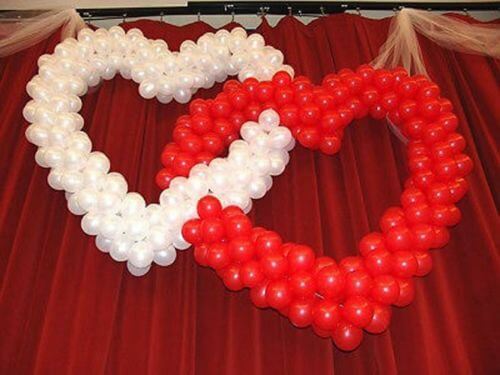 Create a festive backdrop for your wedding table with one or two balloon hearts; decoration kit found at eBay. Whether you go for small table standing figures, or place life-size sculptures next to the cake table, you can be sure to draw attention with those pieces of balloon art. 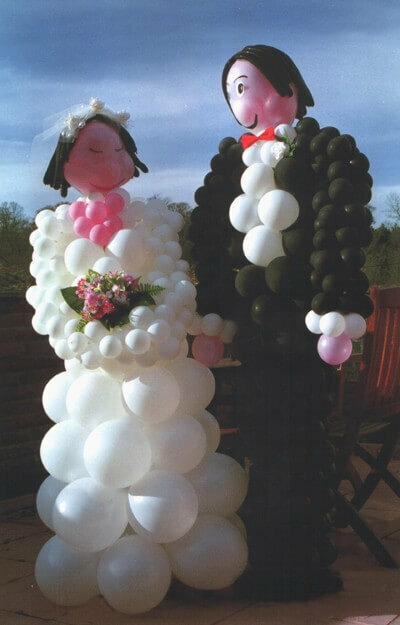 Some Bride & Grooms are made entirely of round balloons, others entirely of twisting balloons or - my personal favourite - you can use a combination of both. It's not a piece of cake, to create these sculptures yourself. If you want to give it a go, you will find a video and links to Bride & Groom 'recipes' here. Bride & Groom pictures courtesy of Balloonaloony, Falkirk, Scotland.